I have been enjoying courses on coursera.org and udacity.com. They have excellent and free online courses from such universities as Stanford, University of California at Berkeley, University of Michigan, and a few other great ones. 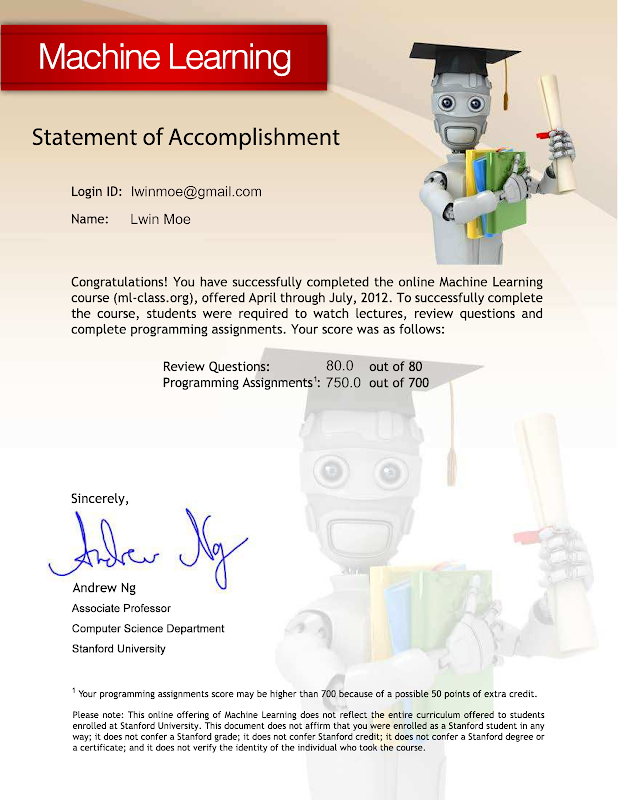 A while back ago, I finished a machine learning course by Professor Andrew Ng of Stanford University. Here is the certificate I got from Coursera. I think these websites are great and will give students from places like Burma a chance to catch up with the rest of the world. I hope students from Burma can take advantage of these courses from coursera.org, udacity.com and edx.org. They just need a good Internet connection and a desire to learn.